According to a recent survey most of the Small business owners across US either do not have a website or they have a sluggish, slow and low quality business website that is of no use in 2019. Today, in this post we will show you how to create a free website for business. Website design technologies have evolved so much that it’s now much easier to create a free business website. Latest Web technologies take out the pain of coding and you can simply drag and drop elements to create a website. It’s upto you what website builder or web design company you choose, here are some basic rules and tips to help you create a business website free with a professional look, search engine friendly and show your company in the best light. But before we dig any further into creating a website for your business for free, let’s first figure out the purpose of your website. What is the purpose of your website and why you should create a website for your business? A website is a digital identity for your business just like a business card. It displays general and meaningful information about your business or company that you manage. A homepage of a website is the main page and it’s the heart of your website, so it should always have the general information about what your business or company does. Whether you are creating a website for business or a company or any general purpose website, always include general information about what you do on the homepage to help customers understand about the business of your company. Here are some examples of the best homepage designs that you can follow. Remember customers don’t spend much time on the websites that have complex navigation structure, always keep important pages of your website in the menu. Here are some tips and examples for designing navigation of a website. Think as a user/customer when you plan to create a free website for business because that helps keeping things simple on the website. A complex looking website will make users leave your website. Display useful images, put all the useful information on the pages of your website and mention your location, address and contact detail clearly. For whatever purpose you are planning to create a website, it should comply with the basic fundamentals of web design and empower your customers with the right information. Another very useful feature of a business website is accepting payments from customers but if you don’t plan to accept payments on your website then you don’t need to get into setting up a payment gateway. In case you are a retailer or service provider and want to offer customers the option to pay online, you’ll need to use a payment gateway such as PayPal, Stripe or Square to collect payments directly on your website. One of the major reasons for not having a website is that the small business owners think that it is expensive to build and market a website. Considering the above situation and the fact that having an online presence is extremely important in today’s digital age, we decided to write a complete guide on ‘how to create a free website for small business’. Now, you must be thinking what this guide covers and how it will help you to create business website free. So let’s get started and we guarantee that by the time you finish reading this guide you had already started building your business website free. The very first thing that you need in order to create a free website for small business is the domain name. Domain name is the name of your website such as www.yourcompany.com and so the best way of choosing a domain name is to include your business or brand name in your website’s domain name. e.g. if your business or brand’s name is ‘star plumbing services’ then you can register a domain name as‘starplumbing.com’. 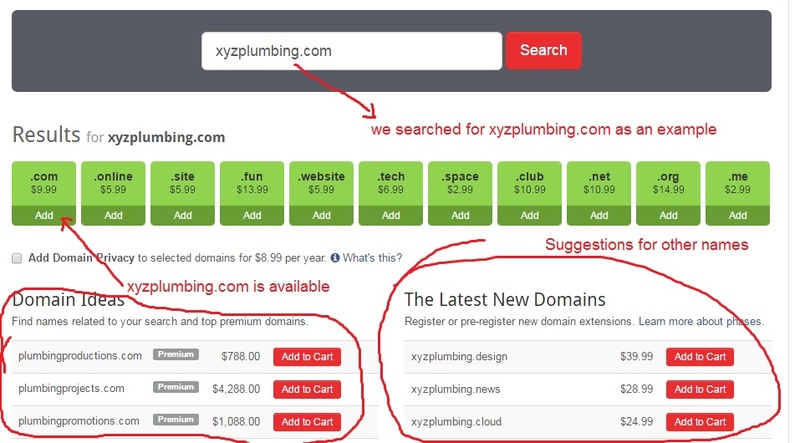 However, it is always not necessary that the domain name that you want to register is available so, you can look for alternative domain name which resembles your business or brand name such as starplumbers.com or starplumbingservice.com. Domain registrars such as godaddy and domain.com also provide you suggestions and different combinations of your chosen domain name helping you to select the best domain name for your small business website. When you want to create new website free online then registering a domain name is the first step. a)Search Engines rank your website better if your domain name is short, easy to remember and contains your targeted keyword. b) If you are a local business or provide local services then it is always a good idea to include the location when searching and registering a domain name such as havcservicehouston.com. It is always a wise idea to include your location in the domain name because people often search for local business or service providers on Google entering the location in search queries. d)Avoid any kind of number or hyphens in your domain name as search engines prefer alphabets over numbers or hyphens in the domain name. Creating a free website for your small business is the first step towards establishing your web presence so, the platform for building a website is extremely important as it will help you in creating a website that exactly matches your business segment and the services or products that you provide to your customers. a)When it comes to creating a free website, the very first option that you can go with is a website builder. It is an online tool for creating your own website simply by dragging and dropping images, text and other graphics. It allows small business owners to choose from thousands of pre-designed templates, images and graphics for creating a website. You simply have to replace the images, content and graphics with your own or you can choose from hundreds of thousands that are already available and within 30 minutes or so your website will be ready for the launch. Your Ultimate guide: ‘How to create a free website for small business” by Advanton. Wix – allows small business owners to create a free website quickly with ease and their starting plans are free. Although they offer premium packages as well on a monthly subscription basis. Their advanced website builder technology offers both beauty and simplicity for creating a stunning website. Impressly– is also among the widely used website builders that allows creating mobile friendly website for small business. It offers an easy and smart website builder tool for creating mobile friendly websites. However, it doesn’t have any free plan but their starter plan starts from $9/month. Weebly– Similar to wix and impressly there’s another very popular website builder tool available called weebly that allows creating free website with ease simply by dragging and dropping the images, content and graphics of your choice. You can also select a theme for your website from their theme collection. Their basic plan is free and you can get started simply by signing up. Web.com– Web.com is among the largest providers of small business website design services for the small business owners in the USA. They also provide other services such as online marketing and lead generation. They can setup a website for your small business free and then may charge you on a monthly basis of additional services that you may ask for you such as online marketing or lead generation or local SEO. Yodle– Yodle provides web presence solutions to the small business owners across USA & Canada. Yodle will help you create small business website, social media pages and provide local advertising services on a monthly subscription basis. It is one of the most popular service providers to the small business owners. Advanton– Advanton is another service provider that helps small business owners in over 160 countries to create a free website, mobile apps, business emails and online marketing. All services are absolutely free and small business owners can expect growth and income quickly with their free online marketing program that puts your website to work for lead generation. Over 10,000 small businesses have subscribed for their free and paid services that are as low as $10/month. it is the most popular and widely used CMS (content management system) to create a free website quickly with ease. WordPress is free to download and use. Unlike website builders such as wix or impressly, wordpress offers a large community of designers and developers that are ready to provide help and wordpress has unlimited themes and plugins to create a free website. Since, wordpress works on PHP and MySQL technology so you may need to familiarize yourself with it by going through its documentation and how to work with the wordpress Admin. The main advantage of using wordpress is that you can update the content of your website simply by logging in to the wordpress Admin of your website and start typing the text or drag and drop images. However, wordpress.org and wordpress.com offer services for as low as $2/month to help you get started with your own custom website. It is another very popular CMS similar to WordPress and runs on same technology PHP and MySQL for building dynamic database driven websites for your business. Similar to wordpress working with Joomla also needs a little bit of familiarization with the platform in order to create a free website. Joomla is free to download and use. It offers hundreds of free themes and plugins and you can create a free website with Joomla by signing up for a free account that lets you use basic version of Joomla and you can upgrade at a later stage. It is also among the most popular opensource CMS written in PHP for creating dynamic websites and ecommerce web applications. Drupal is known for its modular architecture that allows creation of highly flexible websites and applications, offers excellent reliability and security. You can download drupal for free and start building your within minutes website. There are many other free CMSs available for creating free websites but the above two are the most popular with WordPress having the highest market share. content is the most important aspect of your small business website because it will influence your google ranking and the popularity of your website. Whether you create a free website for business or a personal website, content is the key to your success. In simple terms content is the king nowadays and the more useful information you can share on your website for your users, the more likely your chances are for getting better rankings in google search pages and getting social shares. Now, the question is what type of pages must be there on the website and the content that can help your website grow in terms of organic traffic? There are 4 to 5 main pages in a business website and since we are talking about how to create a free website for business so keeping things simple and minimal is the key to success. Homepage– The very first page of the website that speaks about your business or the brand. You should include text that informs your customers about your business or the brand in a simple language, some images, your location and few lines about why your brand is different and why customers should choose you. About Us– About us page is an extremely important page of your small business website as it helps your customers understand who you are, what your background is and about your experience. It gives a sense of confidence to the users in your product or services. Products or Services– on the Products or Services Page you must describe services that you offer or the details about the products that you sell. It can be in 4 to 5 sentences for each type of service or product. Try to be as specific as possible. Blog – A blog page is extremely essential nowadays as it helps in keeping your website fresh with new content and you can inform your audience about new products or services that are recently launched and also you can share your knowledge and useful information with the users and this helps in boosting your organic traffic and search rankings. Boost in organic traffic means more leads that will automatically lead to more business. Contact Us– A content us page must be there on your small business website with a simple and elegant contact form on it. It will enable your customers to directly send you a message leaving their email, phone and message for you. You should always include your opening and closing hours, your location and address to help local customers reach you easily. Adding a google map with your location marker is always a good idea as it helps local customers to find your location easily. So, now you are ready with your website but you need to host it on a server to make it available for everyone over the internet. A web host is like a remote computer that is always on and hosts your website files so that anyone from any part of the world can access your website simply by typing the domain name of your website. If you ever came across names such as hostgator or bluehost on the internet then you should know that these are the most popular web hosting companies in the world and they offer webhosting services for as low as $3/month. For WordPress or Joomla Specific webhosting service you need a little higher configuration and for you can check it here. The most widely used server for web hosting is the linux server and you should choose linux hosting always unless you have a website built using .Net. Whether you run a small shop, store or a own a small business that provides services locally, having a website is extremely important as it is the first step towards creating an online presence and letting your customers find your on the internet. People are searching the web every second for local businesses and service providers and not having a website means you are losing business to your competition. With our guide you can quickly learn how to create a free website and setup your free business website within hours. So, don’t wait to get started with your Free Website Design and Online Marketing for Success and quick income. Our step-by-step guide on how to how to create a website free of cost has helped small business owners setup their websites within few hours. You too can create a free business website in no time if your follow the above mentioned steps. Call US +1(205)624 7254 | EUROPE +44(203)695 0021 or fill out the form! Step by step guide to create a free website by Advanton. Small Business Owners can create a free website following this ultimate guide.